Boeing must perform more work on its proposed fix to 737 MAX aircraft before it can be submitted for review, US officials said Monday, suggesting the planes could stay grounded a while longer. Additional work is needed "to ensure that Boeing has identified and appropriately addressed all pertinent issues," a Federal Aviation Administration spokesman said in a statement. "The FAA will not approve the software for installation until the agency is satisfied with the submission," he added. The FAA statement is the bureaucratic equivalent of a "stop" sign after Boeing officials touted their proposed remedy last week during a media tour at the company's manufacturing plant in Seattle, Washington. Boeing's 737 MAX planes were grounded globally last month following the second of two deadly crashes to occur in less than five months. A preliminary report into the second calamity -- the March 10 crash of a Boeing 737 MAX 8 that killed 157 people -- will likely be issued this week, the Ethiopian government said Monday. Among the changes, the MCAS will no longer repeatedly make corrections when the pilot tries to regain control, and will automatically disconnect in the event of disagreements between the two "angle of attack," or AOA sensors, the company said last week. Boeing is anxious to win approval for a proposed remedy that could get the planes back in the air. But the FAA, which faced harsh questioning last week at a congressional hearing regarding its oversight of Boeing, said it expected Boeing to submit the proposed fix "over the coming weeks" after it undertakes additional work. After that, the proposal will be submitted to a "rigorous safety review," the FAA spokesman said. 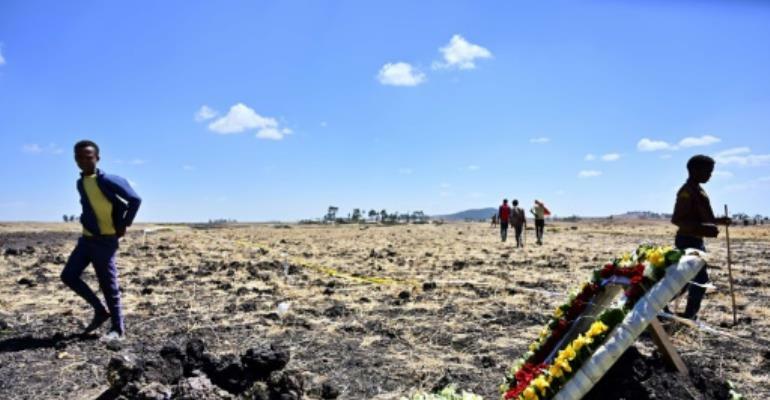 Earlier Monday, Ethiopian foreign ministry spokesman Nebiat Getachew said the transport ministry would release "a preliminary report into its investigation" of the March 10 accident in which a Nairobi-bound Boeing 737 MAX crashed shortly after taking off from Addis Ababa. The Ethiopian government gave no details on the exact timing of the release, nor hints about the report's findings. Nebiat initially said the report would be released Monday but the transport ministry, which is in charge of investigations, later said it would still be some days. "The report will most likely be released some day later this week," ministry spokesman Mussie Yiheyes said. It was not clear Monday if the transport ministry's preliminary report would be made public straight away, or limited to the eyes of authorities including the FAA. Boeing designed the automated MCAS system -- which lowers the aircraft's nose if it detects a stall or loss of airspeed -- for this particular model.